His Highness Sheikh Jaber Mubarak Al-Hamad Al-Sabah was sworn in as Kuwait’s 7th Prime Minister on December 4th, 2011. Prior to becoming Prime Minister, His Highness Sheikh Jaber Mubarak Al-Sabah held the post of First Deputy Prime Minister and Minister of Interior and Minister of Defence in July 2006. A year later, in October 2007, he became First Deputy Prime Minister and Minister of Defence. 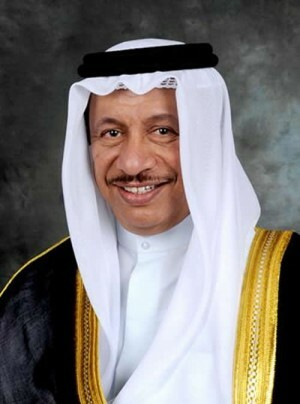 During his service in the Ministry of Defence, Sheikh Jaber Mubarak Al-Sabah drove efforts towards raising the skills and expertise of the armed forces in all sectors (land, sea and air); he also championed the acceptance of women of various proficiencies in the engineering and military facilities, Moral Guidance and Public Relations Departments. His Highness Sheikh Jaber Mubarak Al-Hamad Al-Sabah began his professional career as supervisor of the Administrative Affairs in Al-Diwan Al-Amiri from 1968-1971. In 1971-1975, he became director of the same department; from 1975-1979 he became Assistant Undersecretary for Administrative and Financial Affairs in Al-Diwan Al-Amiri. His Highness Sheikh Jaber Mubarak Al-Sabah assumed the post of Governor of Hawalli Governorate from 1979-1985, and in 1985-1986 he held the position of Governor of Ahmadi Governorate. In 1986-1988, Sheikh Jaber Mubarak Al-Sabah was charged with the Ministry of Social Affairs and Labour portfolio. In 1988-1990, he held the post of Minister of Information. Following the liberation of Kuwait, His Highness was appointed Advisor to the office of the late Amir, His Highness Sheikh Jaber Al-Ahmad Al-Jaber Al-Sabah serving from 1992-2001. On February 14, 2001, he was appointed Deputy Prime Minister and Minister of Defence. In 2004, His Highness Sheikh Jaber Mubarak Al-Sabah presided over the Supreme Council for the Environment. His Highness demonstrated a keen interest in preserving Kuwait and the region's environment from any nuclear disaster should a leakage occur from Iran’s nuclear plants, scrap metal and military vehicles tainted by radiation during the second Gulf war. As well as His Highness's previous accomplishments, Sheikh Jaber Mubarak Al-Hamad Al-Sabah was nominated in 2010 as Chairman of the Higher Council for the Disabled Affairs; whereby conditions and regulations to reduce working hours for the next of kin who are caring for a disabled member of the family were approved, established the principle of equal treatment for each disabled person as "individual cases" in the single family under the age of 18, and finally endorsed the allocation of an allowance for university students up to the age of 26. In 2007, His Majesty King Hamad bin Issa Al-Khakifa awarded His Highness Sheikh Jaber Mubarak Al-Hamad Al-Sabah the "Medal of King Issa First Class" following his visit to Bahrain, where he participated in the Middle East Forum on Internal and World Security. In 2009, His Highness became the first Arab figure to be awarded Japan's highest honour conferred on foreigners; The Imperial Decoration of "Grand Cordon of the Order of the Rising Sun" which was bestowed by Japan's Emperor Akihito at a special ceremony held at the Imperial Palace in Tokyo. The distinction was awarded in recognition of His Highness Sheikh Jaber Mubarak Al-Sabah's efforts in promoting mutual understanding as well as political, diplomatic and environmental ties between the State of Kuwait and Japan. In 2009, French President Nicolas Sarkozy conferred "Legion of Honour Medal of the First Degree" upon His Highness Sheikh Jaber Mubarak Al-Sabah in recognition of his efforts in strengthening ties between the State of Kuwait and the Republic of France.